Bacon is a cured meat prepared from several different cuts of meat. It is usually made from side and back cuts of pork, except in the United States, where it is almost always prepared from pork belly. 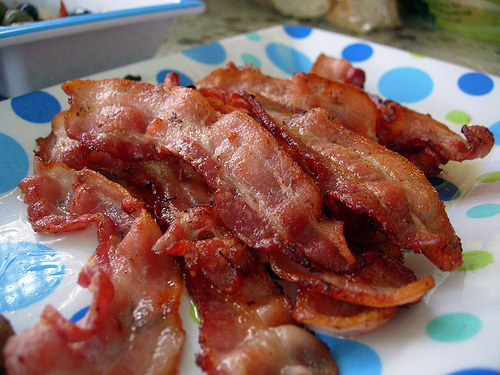 Bacon may be eaten smoked, boiled, fried, baked, or grilled, or used as a minor ingredient to flavor dishes. 1. Mix dry ingredients thoroughly. 2. Rub the ingredients on the skin side of the trimmed bacon, and then on the fleshly portion. 3. Pack the slabs skin down on an enameled or non-corrosive container. 4. Cure in the refrigerator for 1 week. 5. After curing, soak the slabs for a few minutes in warm water. 7. Smoke for 2 hours. 8. Dry for 9 days. 10. Cook by frying in its own lard.